In the 1980’s I remember attending the opening celebration of Designers Walk www.designerswalk.com in Toronto. The event promised to be an important affair in the design and architecture community as Designers Walk was to be Canada’s leading resource centre for interior design. Of course an event as important as this required a new dress! So off I went in pursuit of that perfect dress. After much searching I found ‘the’ dress. It was a light grey, soft and supple suede dress that was sewn in a chevron pattern. Perfect for a design event – on trend colour, great texture, classic pattern. The Designers Walk event was fabulous and the dress was a hit. It was a thrill to be present for this landmark occasion. But the lasting memory I have of this whole affair that to this day still resonates with me is the person I met who sold me the dress. I was in a dress shop and having a difficult time making any decision and getting frustrated trying to zip and un-zip in the change room when a very kind saleslady approached me offering assistance. She patiently zipped and un-zipped for me. It was when I finally tried on the grey suede dress that the saleslady rolled up her sleeves, put her hands on her hips and announced that this was ‘the’ dress. I suddenly froze. There on the saleslady exposed forearm was a tattoo. A number tattoo. During World War II the system of identifying prisoners at the Auschwitz Concentration Camp was to tattoo numbers on to their skin. People were not identified by their face or their name but rather a number indelibly stamped on their body. OMG was all I could think as I stood there trying not to stare at the saleslady’s forearm. She had been at Auschwitz and had survived. She had been witness to horrific events. I have never forgotten this kind, patient lady. 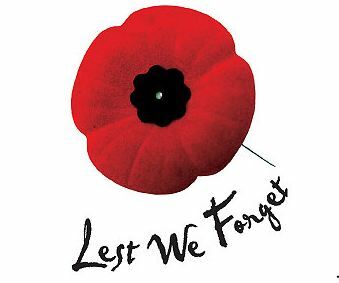 In remembrance to all those who have lost their lives or have been witness to terrible violence during war and fighting I acknowledge their great courage and sacrifice. This entry was posted in Design and tagged HISTORY, Inspiration, Interior Design by Modmissy. Bookmark the permalink. Oh, Michele. What a post. What a post!